When I was a little girl, my mom always made me a cake covered with seven-minute frosting for my birthday. It was my absolute favourite. The reason it’s called seven minute frosting is because you beat it for seven minutes over the stove. She always drizzled it with melted dark chocolate. Preheat oven to 350° F. Grease and flour two 8-inch round cake pans, shaking out any excess flour. In a large mixing bowl, combine the dry ingredients. Add the soup, shortening, eggs, and water. Beat together until everything forms a smooth reddish batter. Fold in raisins. Pour the batter into the cake pans. Bake for 35 to 40 minutes; when the cake is done, a toothpick should come out clean. Let cake cool completely before frosting. Two of my favourite flavours are chocolate and mint. When I spied a package of creamy pastel mints at the store, the kind I grew up with, I had a good giggle — I didn’t even know they still made them! I thought they’d be a lotta fun on a cake. They definitely have a 1950s-’60s vibe to them and they taste great with chocolate! What could be bad? A double dark chocolate layer cake with chocolate frosting and creamy pastel mints. Blast from the past! When I’m going to a potluck supper, I love to experiment. This time I made a three layer chocolate cake into which I added a cup or so of broken up chocolate Andes mints (which you can’t get in Canada–I picked them up in the US) into the batter. 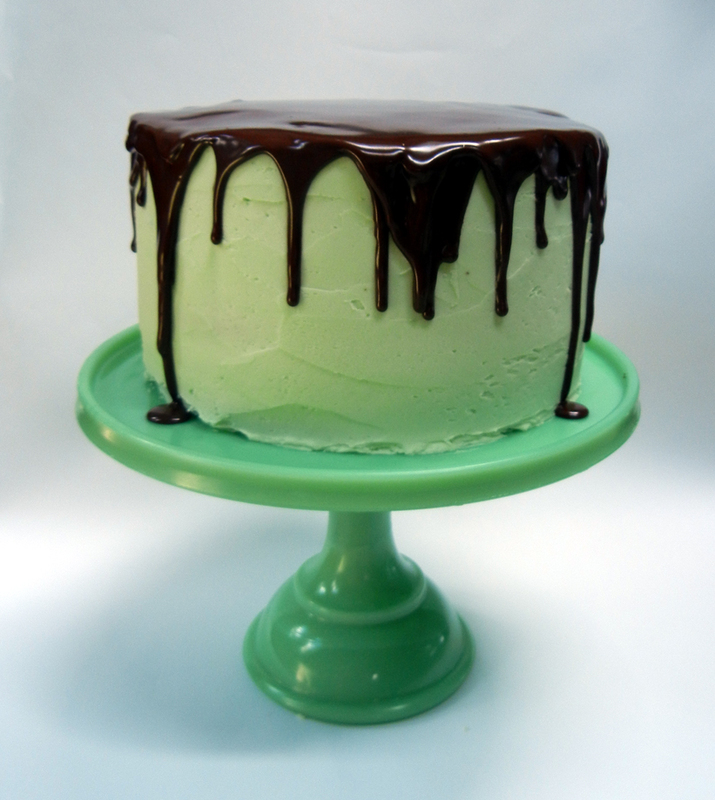 In between the layers and on the outside, I made pale green mint buttercream. And on top and drizzling down the sides is semi-sweet chocolate ganache. It looked to me like a real old fashioned cake. It was a hit and only one tiny piece came home with me last night. Yum!